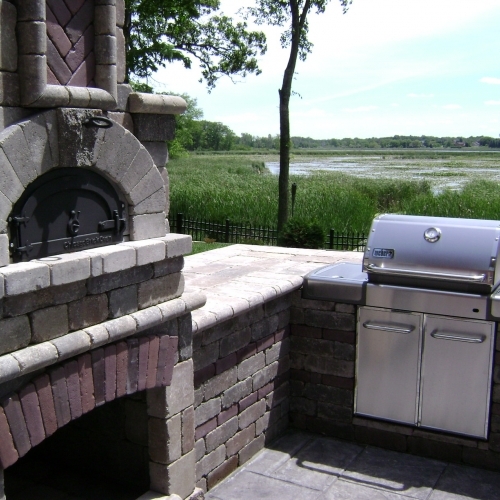 There are a ton of reasons why it is a smart idea to put an outdoor kitchen into your backyard in Fenton Michigan. It will definitely increase the value of your property and it will make it much easier for you to host barbecues and parties with big groups of people at your home. Our company can design and install your outdoor kitchen so it is very unique, perfectly functional and has long-term sustainability. We have been doing exactly this for people in the Fenton area for many years and we are always looking forward to the opportunity to work with a new customer. Feel free to give us a call or request a quote and make sure you hire the right contractor for your upcoming project. In fact, I already have told several people that you all were great. Very nice, very accommodating, punctual, cooperative. We love our new patio and all the landscaping and cannot wait for our first "party" out there in a few weeks. We liked Jake and David and Kevin and Matt and all the crew. Awesome teamwork." Very clean and organized. Took great care to protect my property with plywood walkway. Workers were respectful and careful. I will request quotes for future work." during the installation of our new landscaping. All of them were impressed with the finished product."